Perhaps fittingly, the iPhone's "Phone" app received the most attention. Every button that was previously rectangular is now circular, and many have been given new icons in the makeover. When using the dial pad to make a call manually, the "place call" button now swivels and smoothly morphs into the "end call" button. 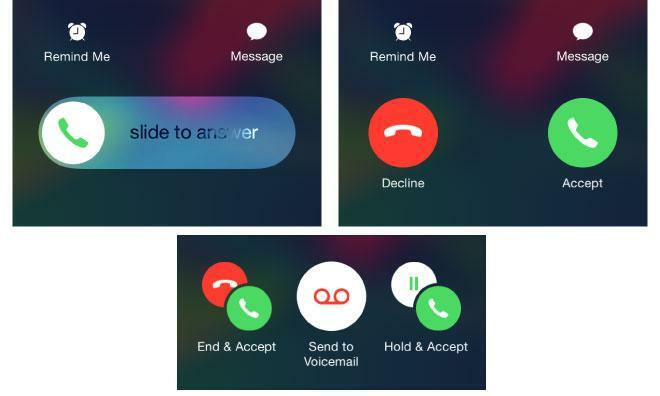 In addition, call waiting controls have been reformatted and moved to the bottom of the display. Apple also made a significant number of tweaks to iOS 7's physics and motion settings. Zooming in and out of folders and apps is now much faster, and many of the in-app transitions are sped up. Notification Center and Control Center now sport much more pronounced "bounces" when being opened, a jarring change from the easing present in iOS 7.0.x. 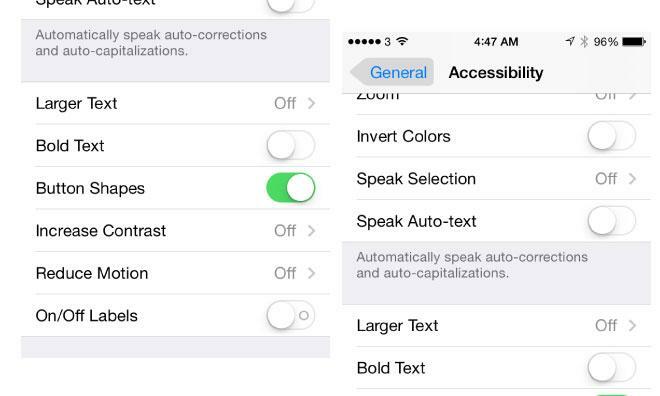 Apple has expanded the array of accessibility options —enabling the "Reduce Motion" option has a more noticeable impact than in previous revisions, and a new "Button Shapes" option adds shaded outlines around tappable areas. 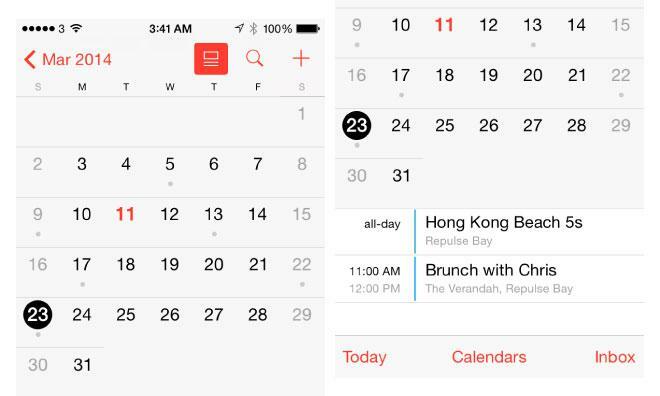 The "Calendar" app now sports a dedicated list view button, which will take users directly to their full appointment list when looking at a specific day. Pressing the same button in month view provides an updated split-screen view with the calendar on top and appointment list below. 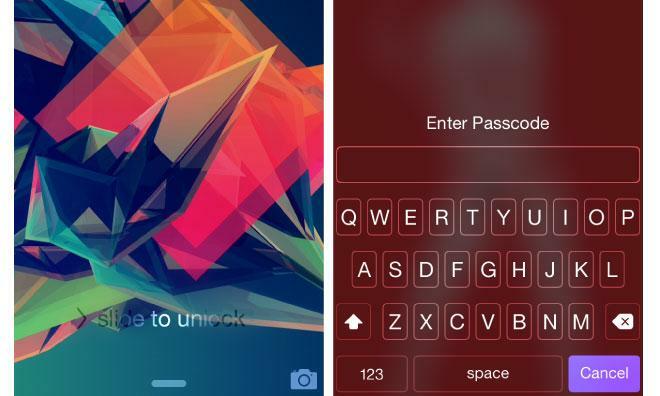 The lock screen's "slide to unlock" text is much more prominent, and the keyboard displayed when using an alphanumeric pass code has been tweaked. Additionally, the system keyboard itself has slightly redesigned shift and caps lock keys. Using the Touch ID sensor to identify an already-enrolled finger now causes the finger's entry to be continuously highlighted, rather than flashing as it did before. Siri, meanwhile, sports a new hold to talk mode that allows users to hold down the home button while speaking and release it to signal Siri to stop listening, useful in loud or busy surroundings. 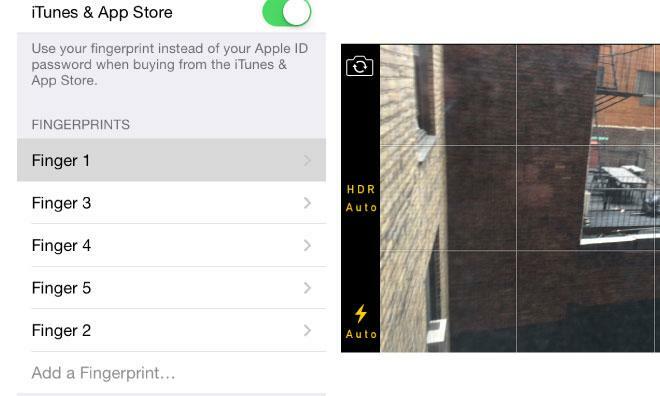 Finally, the "Camera" app now has an intelligent "Auto HDR" feature. When enabled, the camera will analyze the scene and automatically shoot in HDR if it feels conditions warrant it.